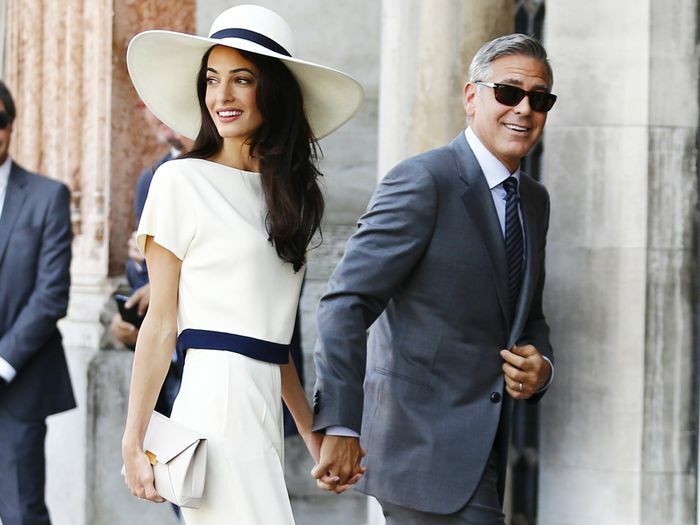 There are a lot of reasons to love Amal Clooney's style: her glamorous red carpet looks, her perfect wedding outfits, and her sophisticated off-duty wardrobe. Lately, though, I've been noticing that Clooney has been excelling in one specific department: pant outfits. If you're anything like me, trousers can be a bit intimidating and hard to get right. It's always so much easier to slip on a pair of jeans and call it a day. From work-ready pinstripe pants to made-for-partying colorful wide-leg versions, Clooney's closet includes a slew of different trousers for nearly every occasion. Just for fun, I decided to give her best pant looks yearbook-style superlatives. Scroll down to see which outfit earned my recognition of "most likely to make your ex jealous," "most likely to land you a raise," and more. Oh, and don't forget the shopping. Your closet could use a few non-denim pants, right?